Public consultations for Chichester’s A27 improvement scheme will start in two weeks’ time and include five options. The ten-week public consultation will get underway on July 14, with Highway England holding 14 ‘information exhibitions’ at venues across Chichester and in neighbouring villages, it has been announced today, Thursday, June 30. The Government transport authority has also revealed details on each of the five options it is considering, which all involve upgrading the initial stretch. They range from adding slip roads at the Fishbourne and Bognor roundabouts only, adding traffic signals to four of the junctions or adding traffic signals to three of the junctions and widening the road to three lanes between Fishbourne and Bognor Road. Project manager Valerie Stephens said: “We are committed to improving journeys for the 45,000 drivers who use the A27 in Chichester every day and now the Government’s record investment in roads means those improvements are coming. “We want to make sure the improvements we take forward are the right ones for drivers and people living and working in Chichester and they deliver the most overall benefit and value. Funding for the scheme has been pledged from the Department for Transport’s £15bn Roads Investment Strategy, with the latest estimate for the Chichester scheme given to be between £100m and £250m, and expected to be ‘at the lower end’, according to Highways’ CEO. Highways said it’s five options were centred around ‘providing people with better journeys, cutting congestion and improving the economy’. n 1 – New slip roads at two junctions (Fishbourne and Bognor) and restricted access at others. n 1a - New slip roads at two junctions (Fishbourne and Bognor), restricted access at Oving only. No works at Stockbridge or Whyke. n 2 - New slip roads at two junctions (Fishbourne and Bognor) and restricted access at others plus closures at Stockbridge and Whyke (north-south movements retained). New Stockbridge link road from Fishbourne to B2145. n 3 – Junction improvements with traffic signals at majority of junctions (except Portfield) and some restricted access. n 3a – Junction improvements with traffic signals to Fishbourne, Stockbridge and Whyke, new improved slip roads at Bognor Road. Widening to three lanes between Fishbourne and Bognor Road. No works at Oving or Portfield. All five options, along with costings, will be presented at the 14 public consultations before a preferred option will be made by the Government later this year. The aim is for construction to start in 2019 with the road opened by 2020/21, Highways said. 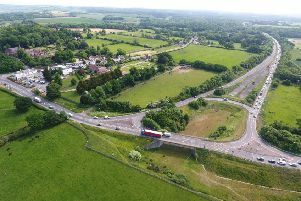 In March, Highways England scrapped controversial options which included building a new A27 northern bypass through Lavant. Since then campaign groups and Chichester MP Andrew Tyrie have expressed fears over the scheme being downgraded. Proposals and feedback forms will be available online at http://www.highways.gov.uk/roads/road-projects/a27-chichester-improvement/ as well as at public information events as follows. Monday, July 25: Chichester Assembly Rooms, 10am–8pm.